Czech Republic, Slovakia, Croatia, 2016, 83 min. 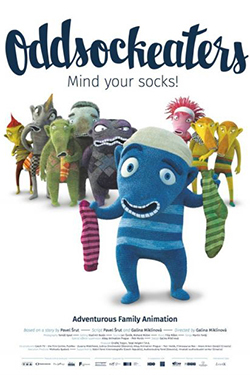 Oddsockeaters are small creatures, who live alongside humans and are responsible for odd socks. They eat socks, but only one from each pair. Brave Hugo introduces us to them. Born 1970 in Ostrava. She graduated from UMPRU M in Prague in 1997, and studied at the University of Humberside (UK). Award-winning director, animator and illustration artist.